From the disc to the stand - how to make a New Year's stand for a cup yourself? New Year's gifts can be very differentformat. Some pursue the goal of making an interesting hand-crafted item in the form of a postcard to please the aesthetic and visual receptors of the person to whom the gift will be addressed. But, this lesson is more intended for those needlewomen who like to create their own crafts and make them so that they are useful. Sometimes, it happens very difficult, especially - when you need to come up with a gift for the new year. In pursuit of new and unique ideas, we havethere are contradictions as to which gift will look more interesting. We offer a universal idea that can be done for anyone and for anyone. But most importantly - the usefulness of the product. 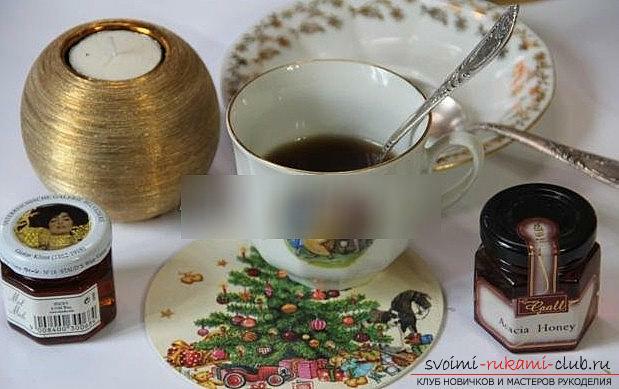 A small round-shaped podstavochka can help a person, you can put a cup of tea or coffee, any other hot objects on this podstanovku, so as not to damage the table. Materials for converting a disc into a stand. Everything would be fine, but such a stand must be a thematic product. That is why, we will design a stand under the New Year theme, using one particular technique. It is a technique of decoupage, which helps to reincarnate any object in a universal and unique version of the craft for use. This time, decoupage technology will have to be used to decorate and strengthen the usual ... CD-ROM. Yes, the era of computer disks is close to completion and now, when the husband plans to throw out another stack of old disks, you can find a worthy application for such a product. Using modern lessons, design and methodsornaments, we have a full-fledged opportunity to organize and create a unique gift made by ourselves. How? See details below. We prepare a gift for these materials.enough for work. And now, let's start the most important process - decorating the disk and turning it. To get started, you need to take the disk to process it under the form of decoupage. The smooth surface of the disc does not suit us, so it is necessary to process it by sanding for both sides. This is necessary for the paint to fit on both sides of the disc. Next, a piece of cardboard must be glued to the gap of the hole to close the gap. After, it is necessary to turn the disk and get a version of the resulting pit, which we patch with a spatula. Next, put the disc down and wait until the putty will dry up. To decorate a disc, you needchoose the option of napkin clearance. It is not difficult to choose a picture of the New Year theme, so, take this process and think carefully about your idea. The pattern should have simple shapes and not be too huge. This is necessary in order to fit into the size of the disk. The fourth part of the napkin needs to be torn off, then - to remove the layer from above. Surface treatment After the putty dries, we mustsand the surface again until it becomes a smooth shape. Then, the disk must be processed on one side with a white paint. 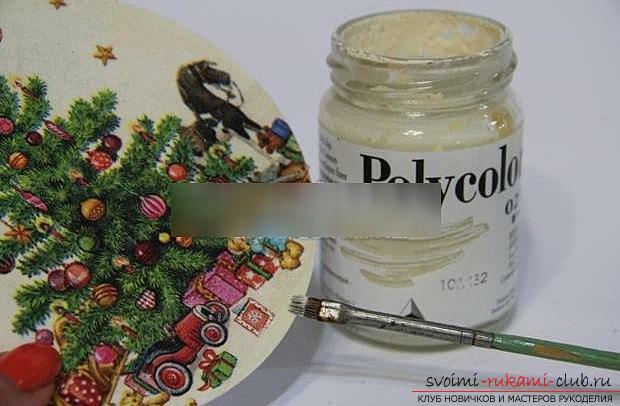 Suitable soft brush, you need to apply more than two layers. After the white paint dries, we can begin the decoupage process. 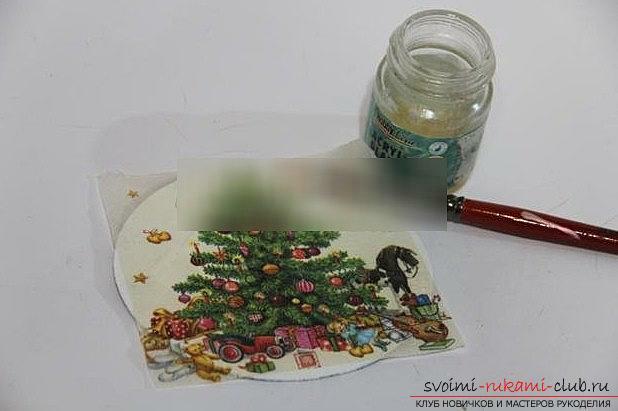 In order to make decoupage, we will use a glue varnish called MARABU. It must be applied to the perimeter of the entire surface, to the place where you are going to glue your napkin. Then, you need to wait 30 minutes until everything dries. Then, you need to put the top of the piece of napkin on top of the disc and cover it with baking paper. We warm up the ironing pad and, with the help of full steam power, iron the surface of the paper. When the glue warms up, the napkin will stick to thedisk on an even level. The fragment of the edge is not needed to be broken yet. After the varnish has dried, tear off the edges that you do not need and sand the circumference of the disc with sandpaper. A quarter of the napkin can not completely cover the disc, because the edges should be painted. 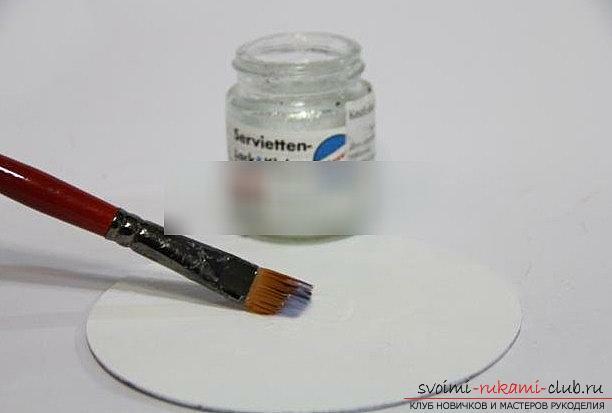 To do this, we select the right color of the paint and apply it to the areas in white color. Obtain an overlap for the napkin. then, the disk needs to be turned over and tear off a piece of cardboard, which we previously pasted. This side should also be painted with white, then with the color of the drawing. Draw the contours of the snowflake, break your work. Initially, we form the circle with the help of points, and then - the middle for the snowflake pattern. We form six rays in symmetry and after - draw the rays. We wait until the contour dries. Using acrylic lacquer, we cover the workpiece of the stand.